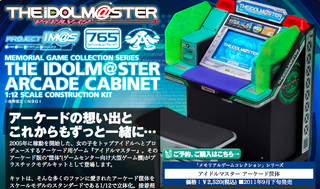 In 2005, Namco released a idol simulator in Japanese arcades called The Idolm@ster. The game ended up being a nerd smash hit, spawning Idolm@ster Xbox 360 and PSP games. It's 2011, and now the arcade cabinet that spawned it all is getting memorialized—as a 1:12 scale model. The cabinet is a snap-fit type model, so no glue is required. There are also alternate monitor screens. Priced at ¥2,520 (US$31), don't buy it because you love Idolm@ster, buy it for delightful and embarrassing photo-ops with figures you already own.